As an Eastside native, Rodney is intimately familiar with the regions exceptional attributes and unique features. 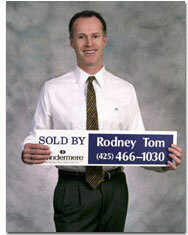 After receiving an MBA from University of Southern California, Rodney obtained his real estate license in 1989 and now has over a decade of experience selling a vast variety of properties, ranging from smaller condominiums, individual lots, entire subdivisions to waterfront estates. On a personal note, Rodney lives in Medina with his wife Debbie, two incredible children, Nicole and Dylan, and the family Golden Retriever, Chanel. When not working, Rodney enjoys exercising, mountain climbing, and golf. Rodney has run three marathons (Seattle, Tri-Cities, and San Francisco) and numerous half marathons. Rodney has climbed all five volcanic peaks in Washington state (Mt. Rainier, Mt. Baker, Mt. Adams, Mt. St Helens, and Glacier Peak). With regards to golf, Rodney enjoys playing a variety of courses. His top ten in-state courses are Snoqualmie Ridge, Sahalee, Desert Cannon, Trophy Lake, Semiahmoo, McCormick Woods, Newcastle, Druids Glen, Classics, and Eaglemont. Rodney’s top ten out-of-state courses are Pebble Beach, Bighorn, Bandon Dunes, Vintage, Cabo del Sol, PGA West, LaQuinta Country Club, Mission Hills, Keole, and Chateau Whistler. Windermere has grown from modest beginnings to become the leading real estate firm in the Northwest. Windermere agents offer you an unsurpassed marketing network to help you reach your real estate goals. Windermere is the Northwest's largest real estate firm. Windermere is a federation of more than 180 offices, all locally owned and independently operated. 4,800 knowledgeable sales associates serve communities in Washington, Oregon, Idaho, California and Arizona. We can be a big company when it comes to buying power, such as advertising. We can be a small, one-office company, to serve a specific community. Knowledgeable sales associates in nearly every Northwest market means you can count on the same quality service wherever you live. We participate in more transactions than any other Northwest firm.